2)Email the filled in Excel sheet to ANTEC EUROPE including a copy of your proof of purchase. For newly purchased, previously unopened Antec AQ 2/3/5/7 products, parts and labor are warranted for (AQ 2/3/5/7) of years from the date of purchase. Replacement products will be warranted for the remainder of the warranty period or thirty days, whichever is longer. Products sold as “B” stock or Refurbished stock have their own limited warranty, lasting 30 days. This warranty is enforceable only by the original consumer purchaser. Proof of purchase is required for warranty service. Note that our warranty is not an unconditional guarantee for the entire length of the warranty. Antec products are made under our exacting manufacturing standards. But, like any other product, they are not indestructible. Therefore, our warranty does not cover product damage that may result from abuse or mishandling of the products, nor does it cover incidental or consequential damage. 1. Any product which has been modified without permission from Antec, or on which the serial number or warranty sticker has been defaced, modified, or removed. 3. Damage, deterioration or malfunction resulting from: Accident, abuse, misuse, neglect, fire, water, lightning, or other acts of nature, unauthorized product modification or failure to follow instructions included with the product Repair or attempted repair by anyone not authorized by Antec, Inc. Shipping or transport damage (claims must be made with the carrier) Any other cause which does not relate to a product defect. 4. Cartons, cases, batteries, cabinets, tapes, accessories or other consumables used with this product. 5. Antec, Inc. does not warrant that this product will meet your requirements. It is your responsibility to determine the suitability of this product for your purpose. 6. Removal or installation charges. Antec’s sole obligation and liability under this warranty is limited to the repair or replacement of a defective product at our option. Antec shall not, in any event, be liable for any incidental or consequential damage, including but not limited to damages resulting from interruption of service and loss of business, or for liability in tort relating to this product or resulting from its use or possession. Please see your product owner’s manual or visit the Online Support section at www.antec.com for details and contact information. In the event that warranty repair or replacement is required, Antec will request and you must provide proof of purchase (store receipt or invoice) in order to receive warranty service. VIII. Warranty Period of Replacement Units. In the event that an Antec product becomes faulty and a replacement is issued with the RMA process, the replacement unit will be covered under warranty for the remainder of the initial unit’s warranty period, or 30 days; whichever time period is longer. Antec will provide return shipping labels for defective replacements within 30 days of the replacement being sent. Outside North America and Europe: If your product needs to be returned within the warranty period, please do so through the retailer or distributor from whom you purchased the product. In North America: Within the first 60 days after purchase, please return your product (or for power supplies installed within our enclosures, just the failed power supply) to your dealer or reseller for a replacement. If the product is still within warranty and you can no longer return it to your dealer, please contact Antec Customer Support (see above) for assistance and instructions. Antec will not accept returns without prior approval and an RMA number. In Europe: Within the first year after purchase, please return your product (or for power supplies installed within our enclosures, just the failed power supply) to your dealer or reseller for a replacement. If the product is still within warranty and you can no longer return it to your dealer, please contact Antec Customer Support (see above) for assistance and instructions. Antec will not accept returns without prior approval and an RMA number. When returning product, please be sure to enclose a clear description of the problem and your proof of purchase with the defective product and return it as instructed by Antec. Be sure to package the product securely (preferably in its original packaging) and ship it postpaid. Your dealer or Antec will not be responsible for damage due to shipping. During the warranty period, your product will be repaired or replaced without charge, excluding shipping and handling. If your computer is not powering on, you may just have a defective power button. 1. Start by unplugging the power switch from your motherboard. 2. Take a flat head screw driver and touch it to the two pins the power switch was plugged into for 1-2 seconds. If the unit comes on then the power button is faulty, otherwise you may want to try the paper clip test on your power supply. The majority motherboards have the front panel pins configured as in the diagram below. 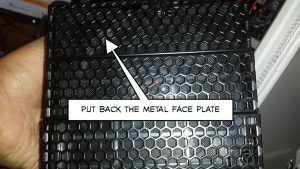 If your front panel appears like the one below, in step 2 you will be touching the tip of the screwdriver simultaneously to pins 6 and 8 of the diagram. Will the Seagate 6TB and 8TB Drives fit? I have measured the drive tray for the P280/P100 and the mounting aligns with the holes on the drive. Another option would be to use the Eleven Hundred, since that uses drive rails that mount on the side of the drives. I have confirmed that the pins for the drives are 4″ apart, which matches the holes on the Desktop drives. Based on my research, I have found that the Standard Desktop Drives will mount properly in any of our cases – there is no proprietary mounting alignment that has been changed at all here. Spare parts that are not listed on the website, please call our toll free number 800-222-6832 to do a phone order; Phone agents are online from 10:30am-3pm Monday through Friday, Pacific Time. If you cannot find the product you are looking for please contact us or speak to one of our support consultants. 1. Remove the side panels. Your drive will attach on the back of the motherboard tray, with screws affixing from the front of the tray. Note: The motherboard should not be installed when installing your 2.5” device in this location. Align your drive’s holes with the drive bay holes. Secure your drive with the provided 2.5” screws. 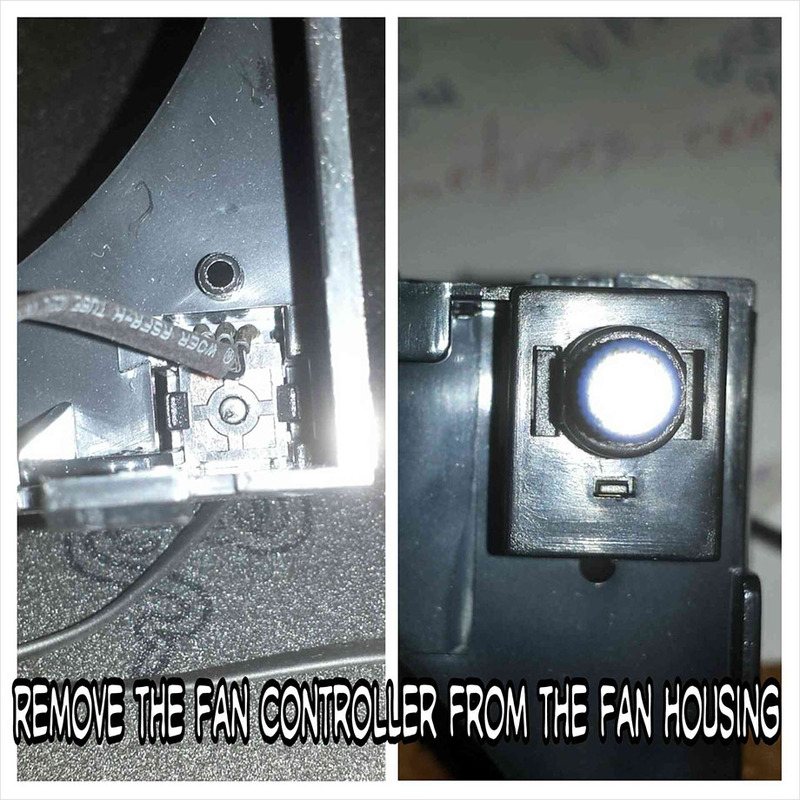 5.Once you’ve separated the clip from the chassis, you’ll have to separate the clip from the power switch. To remove the clip from the power switch you’ll need to simultaneously pull on the switch while pushing on the two tabs that hold the switch to the clip. 2. Disconnect the USB ports, Audio ports, and [if applicable] the firewire port from your motherboard. 3. 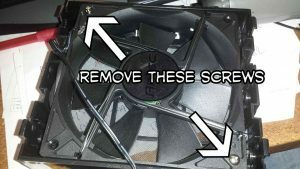 Disconnect the top fan from your motherboard or power supply. 4. Locate and remove the two screws that secure the top panel to the chassis. You will note that one of these screws may have a ground wire attached to it. This ground wire is attached to the front port assembly. 5. Locate and depress the four clips that hold the rear and middle section of the top panel to the chassis. As you depress each clip, lift the panel gently so that the clips remain unsecured. Please be careful at this stage as there are two more clips at the front of the chassis that will be handled in step 6. 6. To release the front clips: grip the top panel as close to the front of the chassis as possible and pull directly upward. You want the force exerted on the top panel to be as close to perpendicular to the chassis as possible. Note: If you still have the power, reset, and LEDs hooked up you should proceed with caution so as not to damage anything. 7. Flip the top panel 180 degrees. Once again note that if you still have the power, reset, and LEDs hooked up, you should proceed with caution so as not to damage anything. 8. Locate the four screws that hold the front port assembly to the top panel and remove them. 9. Pull out the front port assembly. Be careful not to get tangled in the LEDs, power and reset wires. 10. Mount the replacement front port assembly and secure it with the four screws from step 8. 11. Flip the top panel back over. 12. Replace the panel on top of the chassis starting with the front clips and working your way back. 13. Secure the top panel with the screws from step 4. 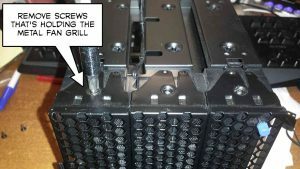 Be sure to attach the ground wire coming off the new front port assembly to one of these screws. 14. Plug in the USB, audio cables, and any front panel connectors (power, reset, LEDs) that you disconnected. 15. 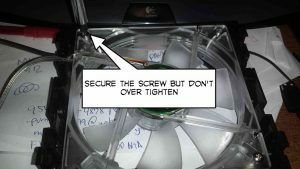 Plug the top fan back into your motherboard or power supply. 16. Reattach the left side panel to the chassis. 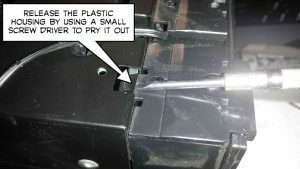 It has recently been brought to our attention that there are a couple parts on the P380 enclosure that are not mentioned in the user manual, which could be quite concerning. If you refer to the pictures below, the two “mystery parts” are explained. The above part can be found behind the right side panel of the P380. 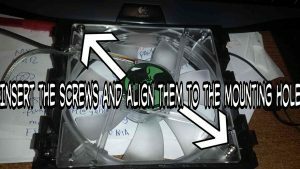 This part is a fan hub, in which you can connect 6 3-pin fan connectors to all be powered by the same Molex connector, allowing for much cleaner cable management. Please be advised that this hub does not support the 4-pin PWM Fans. Two of the three above connectors are self-explanatory. 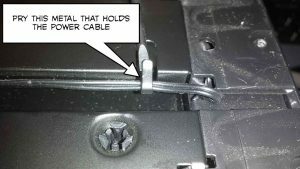 However, the third molex connector with only two pins has caused some customers quite a bit of confusion. The connectors shown here are completely separate from the cables coming from the front panel. These are all attached to the power/reset button assemblies. The power and reset switches are wired into the left side switch hub on the chassis to be powered by the motherboard. 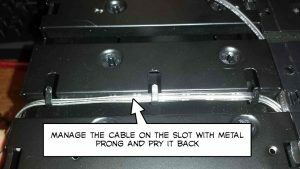 The molex connector serves as a bridge to provide power to the power/reset switch on the right side of the case, thus allowing you to turn your case on/off and reset it from either side of the chassis. If you have any additional questions, please feel free to contact us by opening a support ticket. We will be happy to answer any questions you have regarding our products. For more product information visit this link. For product manuals visit this link.